A three day dance and music extravaganza was on show at Sirpur in Chhattisgarh from 4 Jan to 6 Jan 2014 with artistes from different parts of the country showcasing their talent and participating in the mega event. The aim of the festival was primarily to promote Sirpur at the international level, as a Buddhist tourist destination. The mega show was organized by Chhattisgarh Tourism Board. The historical and ancient site of Sirpur, in Mahasamund district of Chhattisgarh was home to all the artistes who congregated on a common platform for this rich cultural feast. (Aarti Nair, Sapna Attavar, Renuka Iyer, Rashmi Mohan and Parvati Ramesh. Bringing together artistes of various art forms from across the country, the festival was a major step towards promoting the glory of Sirpur and projecting it as a tourism destination. The opening day was marked by ‘SAMANVAYA’ comprising lively folk dances along with a harmonious blend of five classical dances, viz. 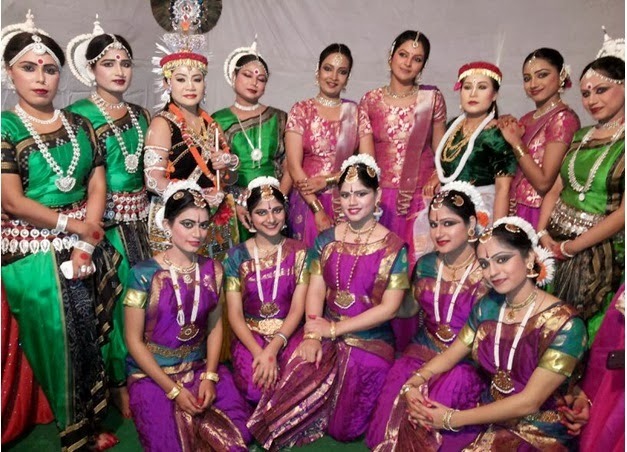 Bharatanatyam, Odissi, Kathak, Manipuri and Kathakali. A matter of pride for Dwarkaites was the on-stage presence on the opening day of the festival, of disciples of Guru Smt. Kanaka Sudhakar, renowned Bharatanatyam exponent and Founder-Director Nrityabharati. Five senior disciples of Nrityabharati added colour to the event and left their mark on the festival, performing a ‘Nritta’ piece – the Mallari with crisp and forceful footwork, symmetrical body movements and graceful postures. Apart from performing Mallari, the five dancers blended beautifully with other artistes simultaneously exhibiting the other dance forms, Odissi, Kathak, Manipuri and Kathakali. The programme which was telecast live by national broadcaster Doordarshan was a treat to watch and won accolades from the appreciative and discerning audience.